Welcome to the website of my art studio. I am a professional artist that specializes in watercolor paintings of wildlife and western landscapes and previously, Native Americans. I also do commissioned paintings of people and pets. I moved from Virginia to Montana in June of 2014, a more than a decade- long dream of mine to live among the landscape that inspires me. I am currently represented by "Artisans on Second" gallery located at 175 South 2nd Street in Hamilton, Montana. 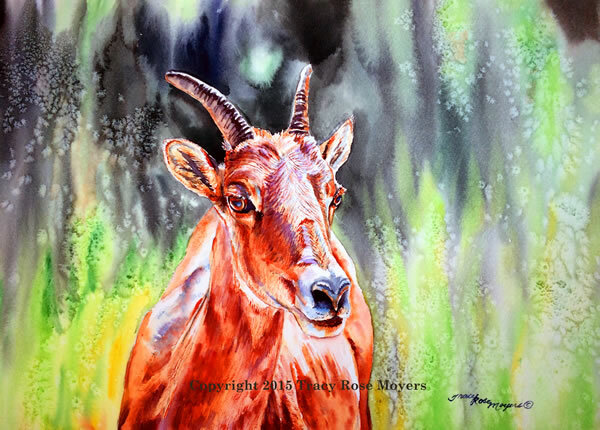 Accepted into Montana Watercolor Society's Watermedia 2016 International Juried Exhibition. Located at Bigfork Art & Cultural Center in Bigfork, Montana on September 30-October 28, 2016. Copyright © Tracy Rose Moyers & Mountain View Product Marketing, Inc.